A third of a century ago, give or take a year, my brother Paul became the first in the family to drive a Toyota. A 1984 Toyota Celica-Supra. It was a true shifting of gears for the Lang Gang. Everyone up to that time had bought a GM. Mom and Dad drove Cadillacs (only one saw 100k). The eldest one had a Monte Carlo (a.k.a. Crapo) that didn’t see the road half the time. Second in line had a Regal (a.k.a. the dying diesel) that ended up stolen and trashed in the Grand Canyon. He actually felt sorry for the canyon. Within three years both these Roger Smith specials were replaced with 1988 Celica GT’s. Great cars with no nicknames necessary. Three years later I had a Toyota Celica GT-S sitting on my driveway. Even better. Still no nicknames. By the end of the decade everyone in the family had a Toyota. Toyota’s quality took a sharp U-Turn and unintentionally accelerated towards the ‘decontenting’ highway starting in the late-90′s. The 1997 Camry, 1998 Corolla, and pretty much every other Toyota that wasn’t a luxury car or a first generation (RAV-4 and Sienna) went straight to the crematorium of cost cutters. 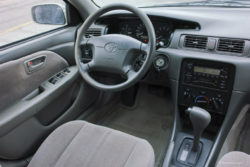 “Affordability is the No.1 priority,” said the 1997 Camry chief engineer Kosaku Yamada. “The Camry is not a luxury car!” and so it became the harbinger of things to come. 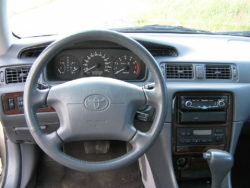 The fourth generation Camry (1997 – 2001) in fact became number one. Not just by beating the Accord and Taurus. But by crushing them into a fine red mist for its entire model run. This was Toyota’s first truly competitive ‘decontented’ model and the net result was about $1500 to $2000 of extra profit per vehicle. Multiply that by the nearly 2 million Camrys that went out the door and Toyota had finally found a true cash cow. ‘Cost improvement’ along with ‘decontenting’ soon became a big part of the Toyota way. But damn were Toyotas expensive before the ‘decontenting’ period. 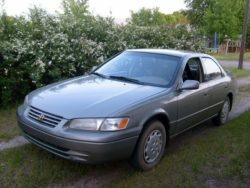 In 1994 I could not get a Camry with ABS to replace the Celica for less than $20,000 retail in my neck of the woods. We’re not talking MSRP…. but retail… before tax, tag and title. I should know because I eventually had to go several states away to find one close to that price. That one has lasted 350k+… but Toyota’s problem, then and now, was that folks simply didn’t buy on the perception of quality alone. Price, features, and performance were the elixirs for most car buyers of the time. Toyota had flashes of greatness with features (Lexus LS and SC) and performance (Supra). But the big Price factor was where Toyota simply didn’t have it anywhere in their line-up. Part of the fault was with the Yen. Toyota couldn’t make the big jump from being the ‘quality champion’ to ‘sales champion’ because their cars were just too expensive out the door if they were sourced and built in Japan. In five years the value of the Yen to the American dollar went up by nearly a third. 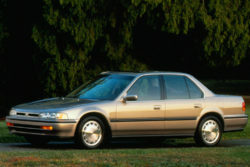 On the homefront, Honda offered a smaller and cheaper Accord that was heavily sourced in America by the early-90s. Ford had a Taurus that was corner cut and subsidized by everything from rental car companies to an absurdly ancient powertrain. While Toyota would offer families a $20,000 Camry with ABS. You could far more easily get one from Ford that was $4,000 cheaper… the Accord was $2,000 cheaper. Both of them were well thought of in the marketplace with Honda’s Accord being the retail sales chamption.